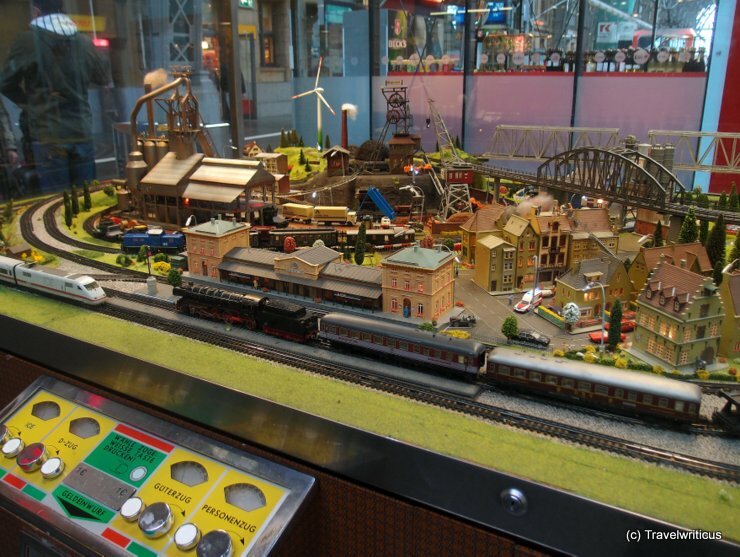 In several German railway stations, there are model railway layouts where children (and their parents) can play with after putting in a 1 Euro coin. The layouts are pretty large and offer a lot of interesting details. Do you know similar layouts in your city and would you spend a Euro for having such fun? I took this photo at the central station of Frankfurt am Main while waiting for my connecting train to Essen. Some details of the layout made me smile. Can you see the shaft tower in the background? I was just on my way to several selected places along the European Route of Industrial Heritage so this model railway layout was a good starting point for my trip. This entry was posted in Railway Stations and tagged Frankfurt am Main, Germany, Hesse by Travelwriticus. Bookmark the permalink.